WWI Profile: Van Grissett Mintz 1893-1929 | Friends of Fort Caswell Rifle Range, Inc.
Van G. Mintz was born and raised in Shallotte, Brunswick County, NC. Van had one brother who also served in WWI, Pvt James Roland Mintz. On June 23, 1916, Van enlisted in the NC National Guard, served in Mexico, then was eventually assigned to Company E, 119th Infantry, 30th “Old Hickory” Division. The advance continued, as shown on this map. The 119th Infantry began advancing at 3:30am October 8. They formed at Premont [see map]. They began capturing material and liberating French citizens who had been under German control for four years. Upon the entrance of the Americans into the village and before the Germans had been driven entirely out, the civilians were in the streets offering the soldiers hot coffee. They could not be too kind to their liberators. It seemed to surprise them greatly that the troops occupying their town then were friendly Americans. They thought that the British had freed them and it was sometime before they could believe the truth. They arrived close to Busigny, then waited until the following morning to resume their advance. Regimental HQ had moved to Premont and a runner was used for communications. Wires had been nearly impossible to maintain throughout the barrage, so pigeons and dogs were also often used for communications. The advance continued without meeting very strong resistance until the town of St. Souplet on the west bank of the LaSalle River was reached; about 3:00 o’clock that afternoon. Here the enemy apparently had time to make some preparation and to bring up a few reserves, as the Heights immediately east of the River were well protected. Heavy Machine Gun and Artillery fire was received from the entire ridge covering the Regimental front. It was practically impossible to advance up this open incline without the sacrifice of a great number of lives. Repeated efforts were made to cross the River, and at a few points were successful but due to the nature of the terrain and the terrific Machine Gun fire, it was deemed necessary to dig in and hold the line along the west bank of the River, as a counter-attack was anticipated, but never materialized. The left flank of the Regiment at this time was connected with the 25th British Division but the right flank was exposed as the 120th Infantry had not kept up, causing the line to bend back in front of several fortified Machine Gun posts. Confronting these conditions, the line was ordered to halt and make good a general line along the west bank of the LaSalle River and gain contact with the 120th Infantry, which was done later that night. During the day’s operation the Regiment advanced to a distance of 4,000 yards and captured the towns of Escaufort, St. Souplet and St. Benin, liberating 706 French civilians. A large number of Machine Guns and several field pieces were captured with a large supply of ammunition. That afternoon about 2:30 o’clock Regimental Headquarters moved from Premont to Busigny. The night of the 9th-10th of October was spent in consolidating the captured position and to gain contact with the unit on the right which had been held up by Machine Gun fire. It was the plan that as soon as this connection had been made an Artillery Barrage was to be laid down on the whole front thus enabling the entire line to advance. The German position could not be taken without this preliminary preparation by the Artillery so strongly was it defended. The Regiment then rested for five days. Cpl Metz was slightly wounded during these operations. He returned to duty on November 1, 1918. The Regiment had completed another intense advance while he was recovering. They were now replenishing and filling their ranks with replacements for those killed or wounded. Van Metz was now Sgt Metz for “gallantry under fire” [see below]. The Regiment would not fight again, as the Armistice was signed before they were ordered back to the battlefields. After returning to America, 1st Sgt Van Mintz required more hospitalization and was finally honorably discharged on August 13, 1919. He was reported as 35% disabled. News and Observer [Raleigh, NC] 21 Aug. 1919, p.3, published this news from Goldsboro. Sergeant Van G. Mintz, of Co. E, 119th Infantry, who served under Capt. E.H. Bain, of this city, in Mexico and later in France, and was promoted to sergeant for gallantry under fire, and who has been a patient at the government hospital in Asheville since the return of his division, has arrived in Goldsboro and is being cordially greeted by his many young friends here. Camp Sevier, SC, became a tuberculosis treatment hospital for discharged soldiers after the war. Van Mintz was a patient there in 1920. Van Grissett Mintz passed away on May 13, 1929, at age 36. His death record lists his occupation as salesman. He left behind a wife and young daughter (Elizabeth Mintz Hair). 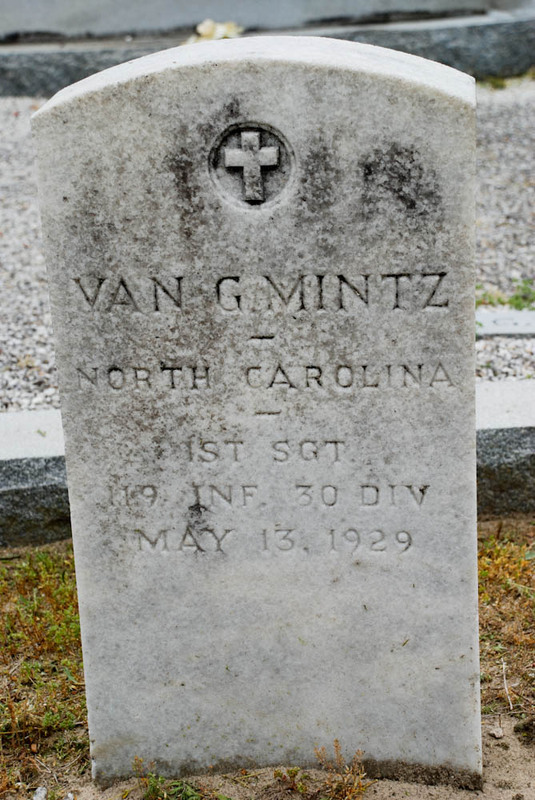 Van G. Mintz was laid to rest in Mintz Cemetery. A military headstone is shown.